Domingo snagged another big one! 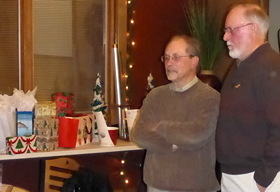 December 14: Rocky Mountain Flycasters Annual Holiday Party! Save this day for the Annual Holiday Party at C.B. & Potts’ Collindale, at 1441 East Horsetooth Road. 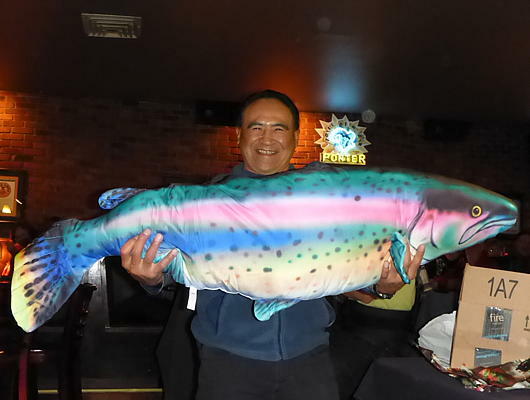 What a great time to get together with other Flycaster members and trade stories of the past season’s fishing exploits, have a bit of food and beverages, participate in the (in)famous White Elephant Gift Exchange, and get a few raffle tickets for one of two fly trees, or even a new fly rod. We have a fun party at this time of year so put it on your list. Reservations purchased before December 12 are $15 per person and then $20 at the door. Reservations can be made through our Holiday Reservations page. The White Elephant Gift exchange is an event not to be missed so the gifts are often well guarded. Grab this .ics file and add it to your digital calendar as a reminder. December 19: RMF Board Meeting at 7:00 PM. Members are welcome to attend any board meeting. Check with a Board Member for the meeting location and/or agenda.